My son's fascination with Teriyaki Chicken has made him a rather agreeable individual when we insist on eating Japanese. Although the dish could be considered one of the "safer" options, it is at the very least not Udon in soup (really hated ordering that all the time). So when we were heading home one rainy night, it made for an easy decision for dinner. Not being particularly adventurous nor having any sort of plan, we stopped at Miyako Sushi (which was on the route home). Upon looking at the menu, the "Pick any 3" items for $8.95 looked like a great way to feed the kiddies. 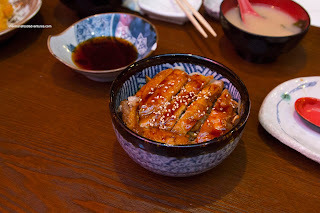 One of the choices was the aforementioned mini-Teriyaki Chicken Don. 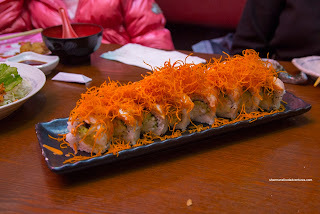 We also got the Appetizer Tempura and Wild Salmon Roll as well. Although the rice was pretty soft and wet in the don, the chicken itself was fairly tender while not being over-sauced. 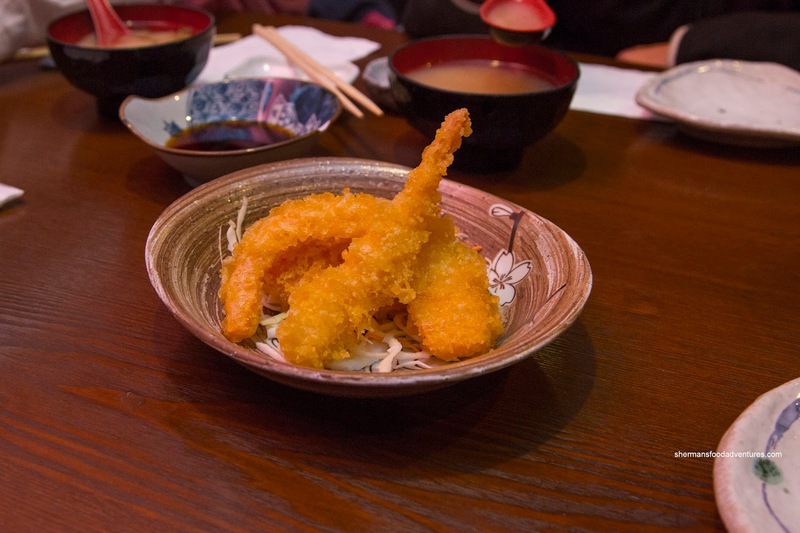 We weren't that impressed with the tempura as it looked rather dark in colour, possibly from the use of old oil. Hence, the flavour was as such and the veggies were somewhat undercooked while the batter was super greasy. For Viv and myself, we got the Assorted Sashimi consisting of salmon, tuna, tai, hokkigai, tako and hotate. The slices of salmon and tuna were pretty large, yet not cut with much precision. Due to its thickness, the salmon was a bit difficult to eat. It was decent in quality though as it was relatively sweet with a toothsome texture. The tuna was fairly soft and not overly flavourful. 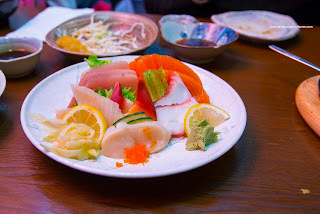 Yet for $13.95, this was a pretty large order of sashimi. Looking more like a full order of Futomaki, the 1/2 order was another good value. By its appearance alone, we thought it would be dense. One bite and no, it wasn't dense at all, but the rice was a little wet and soft. 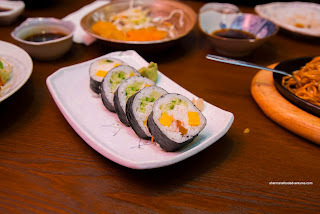 I wasn't a huge fan of the large amount of imitation crab though, as it resembled a California Roll rather than a futomaki. 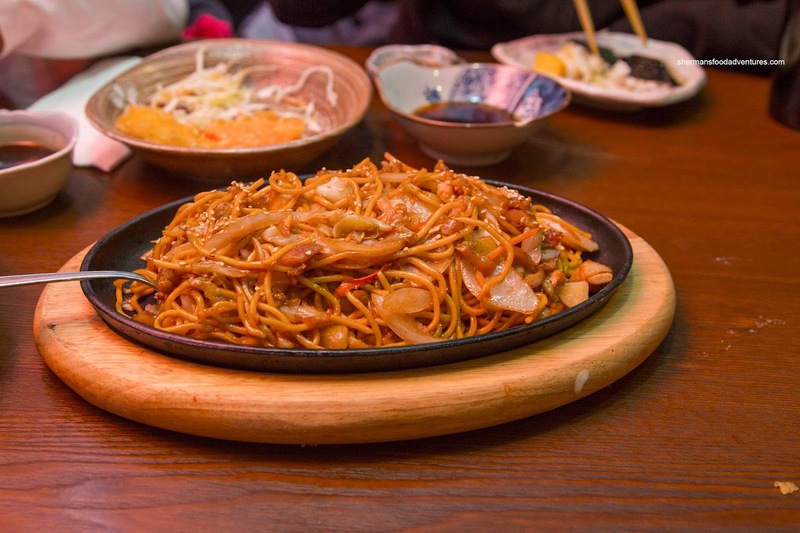 As a filler, we got the Chicken Yakisoba served on a sizzling cast iron plate. I liked how there was very little "sauce" on the bottom of the plate. In turn, the noodles remained chewy and not overly sweet. On the other hand, there could've been a touch more seasoning as the dish was quite mild in need of some tang. The veggies retained some natural texture while the bits of chicken were a bit dried out. Our specialty roll of the meal was the Awesome Roll consisting of a California roll topped with seared salmon and crispy yam strings. Once again, the rice was pretty wet, which made the roll heavy to eat. There wasn't much inherent flavour to the roll either. Just to ensure that the kiddies got their fill of food, we added the Chicken Karaage as well. 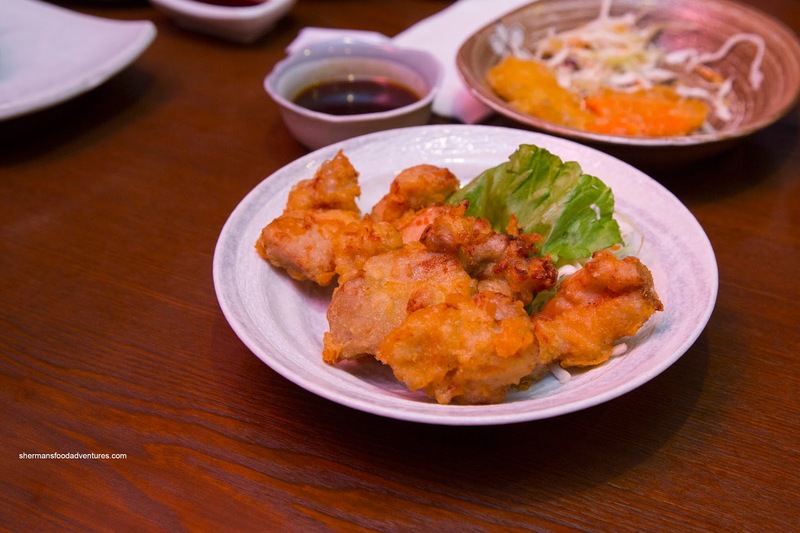 Prepared with large pieces of dark meat, the chicken was tender and succulent. It was lacking in seasoning though. Furthermore, the batter wasn't exactly crispy, being quite greasy instead. 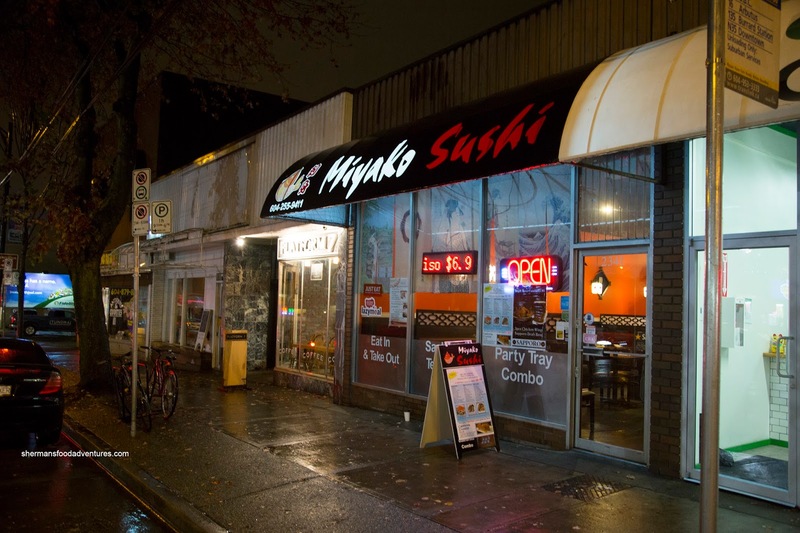 As you can ascertain, the food at Miyako Sushi wasn't exactly authentic. Now that shouldn't be a determining factor as long as the food is good for what it is. In this case, things were alright, but hardly memorable.